Boneless skinless chicken breasts can get pretty boring. Chicken legs and thighs are much more flavorful, but they have a lot more saturated fat, so we mostly stick to chicken breasts here in the Dear household. The key to cooking flavorful chicken breasts is to marinate and not to overcook. This recipe for success keeps them flavorful and moist. I decided to spice up my chicken breasts with a little lemony flavor. When my neighbor offered the use of his grill, I thought hey, why not. Well, I didn’t pick the right day because it started raining as soon as I got the meat on the grill. I ended up cooking the rest inside on my trusty grill pan, and it all worked out just fine. 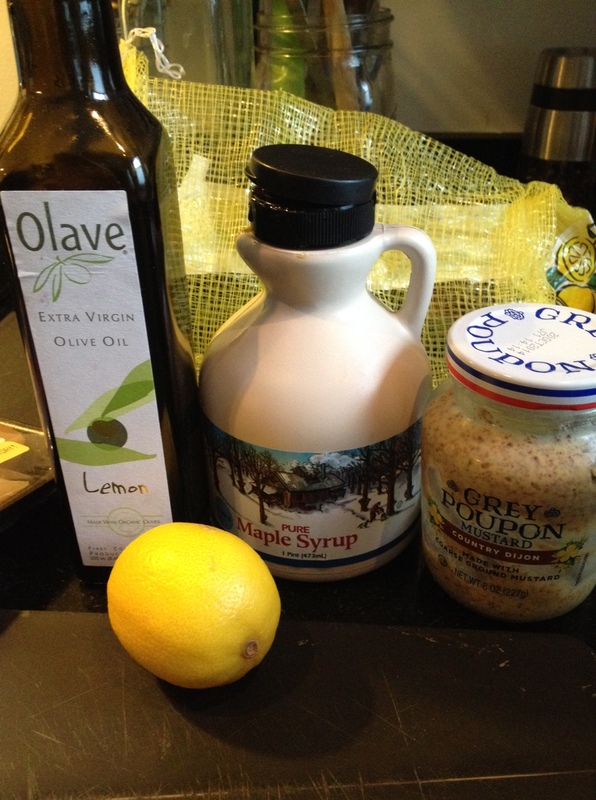 For the marinade: lemon olive oil (it is delicious!) + lemon juice + lemon zest + dijon mustard + maple syrup. Here’s the marinade…I like to call it modern art. 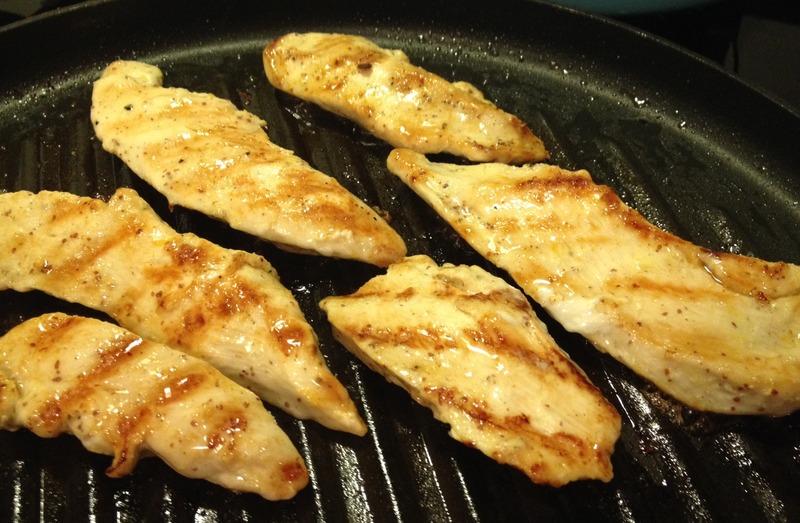 Cut up your chicken breasts into long strips and marinate them for at least half an hour, but overnight would work too. 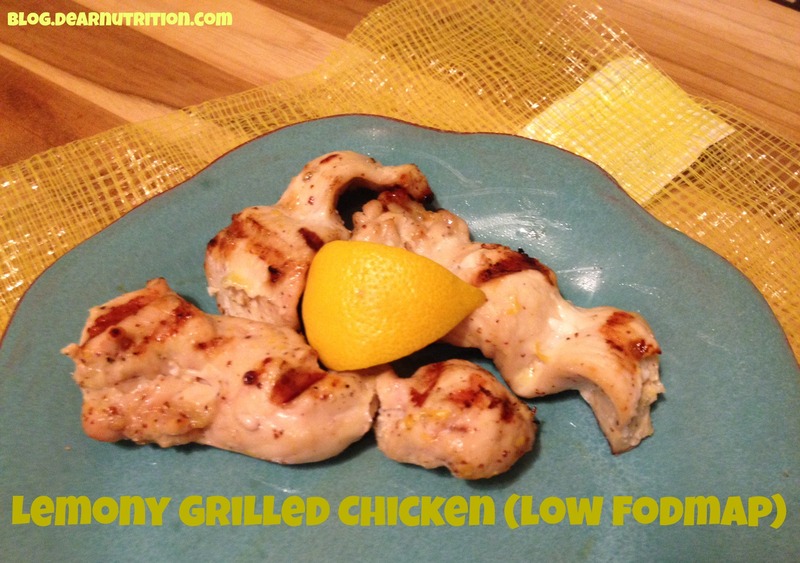 Put the chicken onto skewers and grill on an outdoor grill or grill pan. It would also work to just bake them in the oven. Stop cooking as soon as the internal temperature reaches 165 degrees F.
Serve with fresh lemons for garnish and a side of vegetables and your choice of whole grain (brown rice, quinoa, etc.). 1. 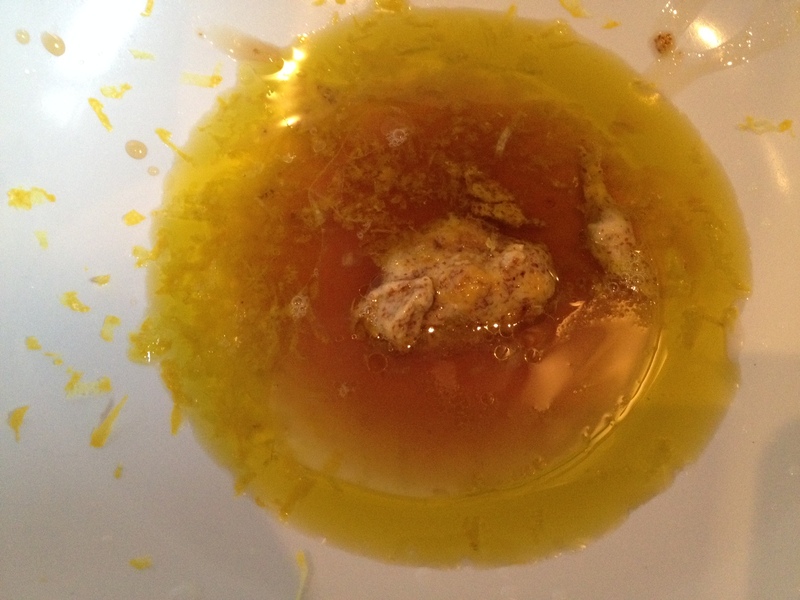 Mix the olive oil, lemon zest, lemon juice, maple syrup, and mustard together. 2. Add the chicken and let marinate for at least half an hour or overnight. 3. Put the chicken on skewers or just lay the strips on a greased and heated grill. If you don’t have a grill you can bake them in the oven at 350 degrees F. Cook until the internal temperature reaches 165 degrees F.
Last night we got a lot of snow here in Boston. Unfortunately the snow interfered with my dinner plans, so at 7:30 I had to whip up something fast. In the fridge: stir-fry chicken, kale, potatoes. 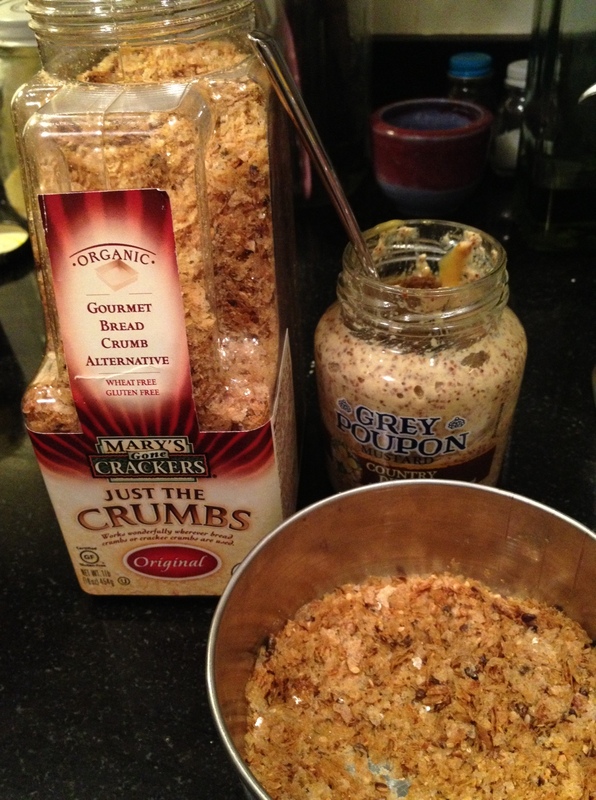 On the shelf: gluten-free bread crumbs made by Mary’s Gone Crackers. Dinner = home-made chicken nuggets, roasted potatoes, and steamed kale. Note: this recipe can be made vegetarian by substituting tofu for the chicken. The bread crumbs are cleverly named “Just the Crumbs.” I like that they’re made from brown rice, quinoa, and seeds, which make them healthier than other bread crumbs and have more fiber too. You can order them here. (I have no financial interest in the company.) 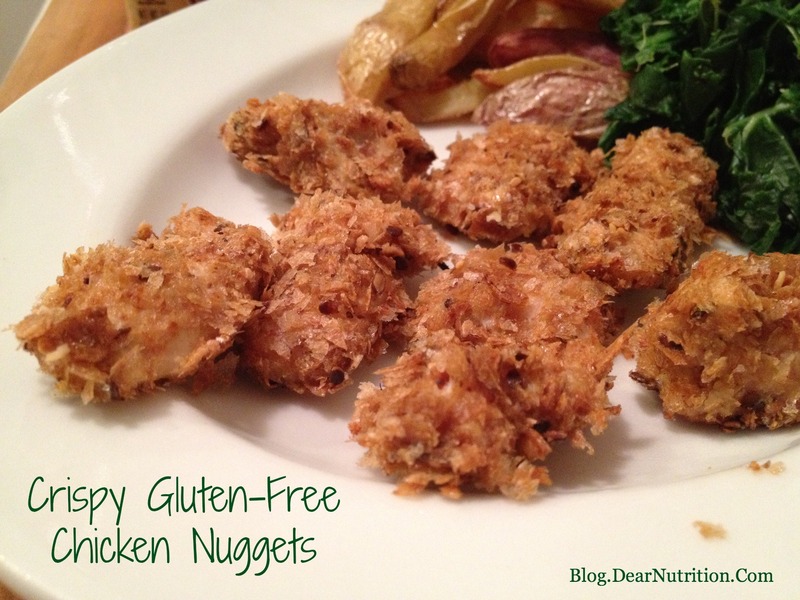 This was my first time using them and I was delighted with the result — crispy nuggets with no deep fryer involved. To make the chicken nuggets, purchase stir-fry chicken meat or cut up boneless skinless chicken breasts. Mix together one egg, one tablespoon dijon mustard, and a pinch of salt. First dip the chicken in the egg mixture, then in the breadcrumbs. Bake for about 20 minutes and you’re done! Serve with roasted potatoes and steamed kale or any other veggies you happen to have in your fridge. 1. Preheat oven to 350 degrees F. Mix together the egg, mustard, and salt in a small bowl. Pour the breadcrumbs in another small bowl. 2. Dip each chicken piece first in the egg mixture, next in the breadcrumbs. Make sure the entire piece is coated. 3. Placed on a greased baking sheet and bake for about 20 minutes until chicken is cooked through.